Add the rest of the ingredients and blend until mixture begins to come together. Grease a spring form cake tin with olive oil or butter. Take some of the mixture and start to lay on the base of the cake tin – 1/2 centimetre thick is a good thickness and continue until the base is completely covered and even. You can go up the sides of the tin also if you wish, although I like to keep the sides free so that when you take the pan off you can see the delicious filling. 2 tbsp chia seeds soaked in 4tbp water for at least 15 mins. 1/2 cup coconut sugar (or sugar of your choice). The mousse is also delicious using only 1/4 cup sugar. If using whole cashews, place in a ziplock bag and break nuts down using a rolling pin to hit the nuts. Place cashews in 3 cups water, and allow to soak for at least 12 hours. Soaking the nuts makes them soft and will easily blend to a smooth paste. Place can of coconut cream either in the fridge overnight, or if short on time in the freezer for 1 hour. This thickens the cream and gives body to the mousse. When ready to make the mousse, drain the water from the cashews and blend on high speed until a smooth paste forms. You may need to continuously turn off the blender to scrape down the sides and stir the mixture. This may take several minutes. If the nuts don’t completely break down, add a tablespoon of coconut cream at a time and blend (see step below). The nuts should break down with the addition of the cream. Continue to stop the blender and scrape down the sides of the container and stir to ensure a silky smooth mixture. Add the cocoa powder and coconut sugar to the mixture and blend to combine. Finally, sprinkle the extra 1tbsp of chia seeds on top of the mixture and blend to combine. Continue to blend for approximately 3 minutes. The longer you blend, the smoother and fluffier the mousse becomes. Pour the mousse into the tart shell and place in the freezer to set quickly for 2 hours. 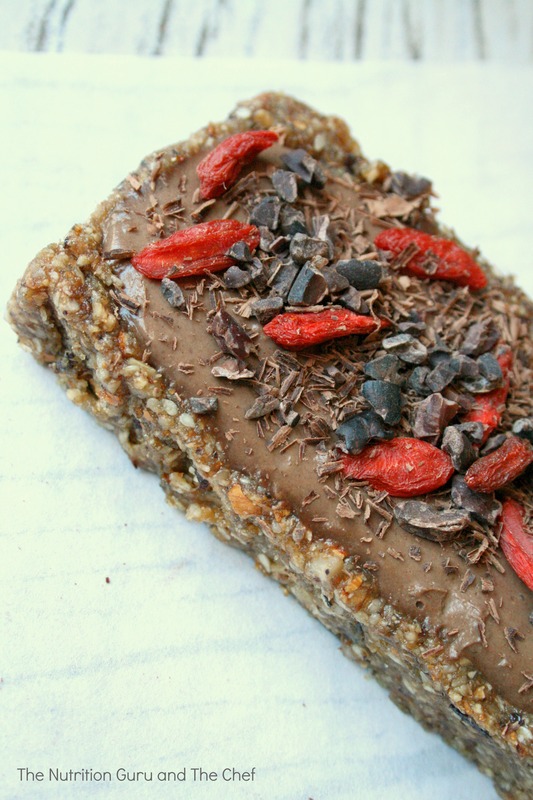 To serve, sprinkle with any of the following: sifted cocoa, cacao, cacao nibs, goji berries, coconut flakes, orange zest. It’s not calorie or fat free but it is packed with a powerful nutrient punch. Coconut sugar is low GI. It still contains the same amount of calories as white sugar, though won’t give your blood sugars the large peaks and troughs. It also has a delightful caramel flavour. Sunflower kernels are also fabulous sources of monounsaturated and polyunsaturated fats, fibre and Vitamin E and have anti inflammatory effects. Like almonds, sunflower kernels are also high in protein. My favourite nutrient in the world, tryptophan is found in high levels in sunflower kernels. This amino acid can help to make us feel happy, as once it enters the body it is converted to the happy hormone serotonin. 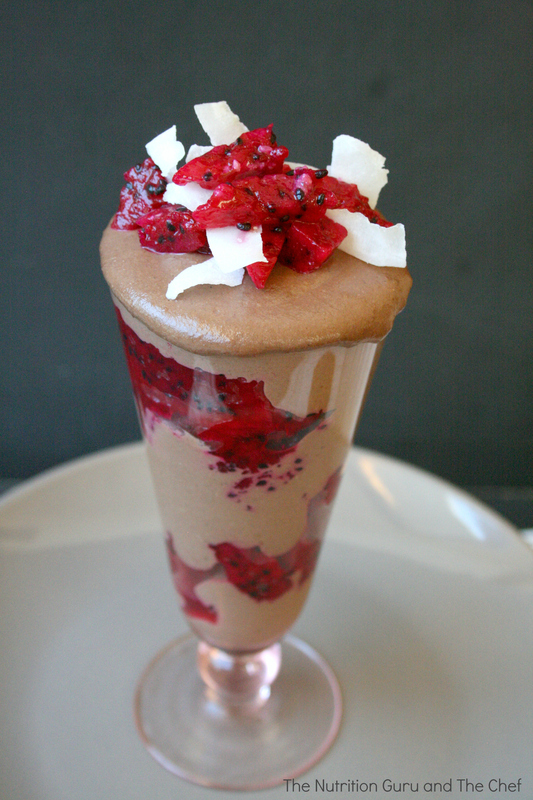 Normally mousse contains melted chocolate containing fat and loads of sugar. It also contains whipped cream. Although this mousse is not by any means calorie free, though it does contain MORE nutrition than normal every day chocolate mousse. Chia – fibre, protein, iron and omega 3’s. The chia is used to set and thicken the mousse. Coconut cream: Delicious flavour. It contains sarated fat, and half of this saturated fat is still the bad fat for our heart, though half is actually good. (I still only recommend coconut in moderation, you can read my article here). Cocoa: Contains fibre, vitamins and minerals and gives that super chocolate hit, without the fat and sugar normally added to chocolate. Coconut Sugar: Has a delightful caramel flavour and a GI of only 35, making it a low GI sugar. This means, it does not give your blood sugar levels the high and low peaks and troughs. Cashews: Packed full of fibre and wonderful heart healthy unsaturated fats. They are also high in minerals such as iron, potassium, manganese and copper as well as phytochemicals to protect against cancers and disease.